Download "단원 지도 계획 차시 항목 교과서쪽 학습내용 Introduction 155 학습 요점과 글의 요지를 파악한다. 제목과 그림을 통해 이 과에서 학습하고자 하는 내용을 예측해 본다. 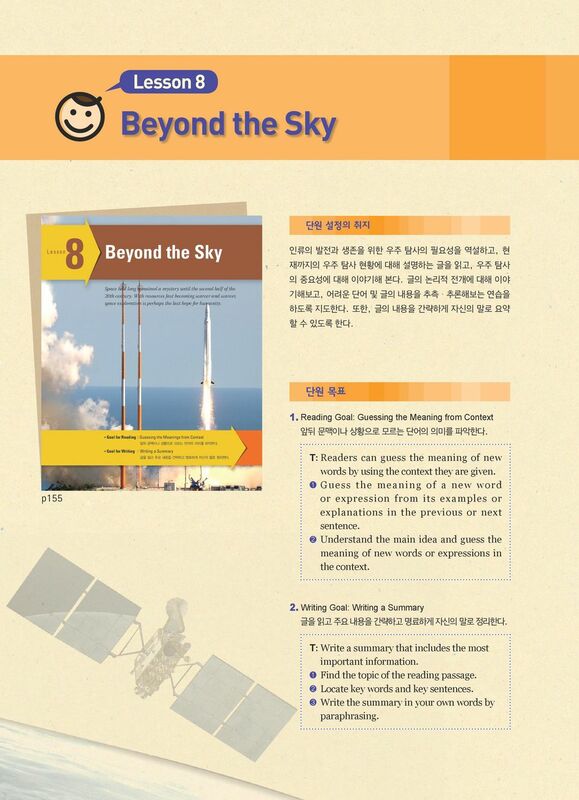 Before You Read 156 본문을 읽기 전 우주 탐사에 대한 인용문을 읽고 자신의"
1 Lesson 8 Beyond the Sky 8 Lesson 단원 설정의 취지 Beyond the Sky 인류의 발전과 생존을 위한 우주 탐사의 필요성을 역설하고, 현 재까지의 우주 탐사 현황에 대해 설명하는 글을 읽고, 우주 탐사 의 중요성에 대해 이야기해 본다. 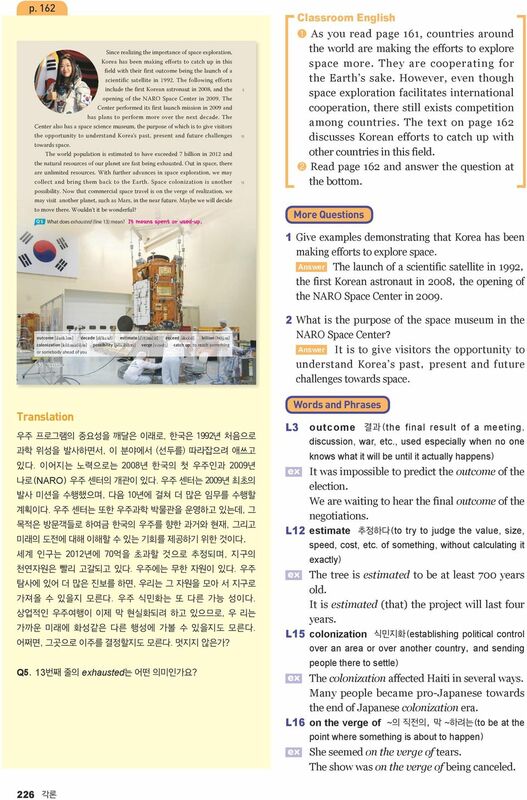 글의 논리적 전개에 대해 이야 Space had long remained a mystery until the second half of the 20th century. With resources fast becoming scarcer and scarcer, space exploration is perhaps the last hope for humanity. 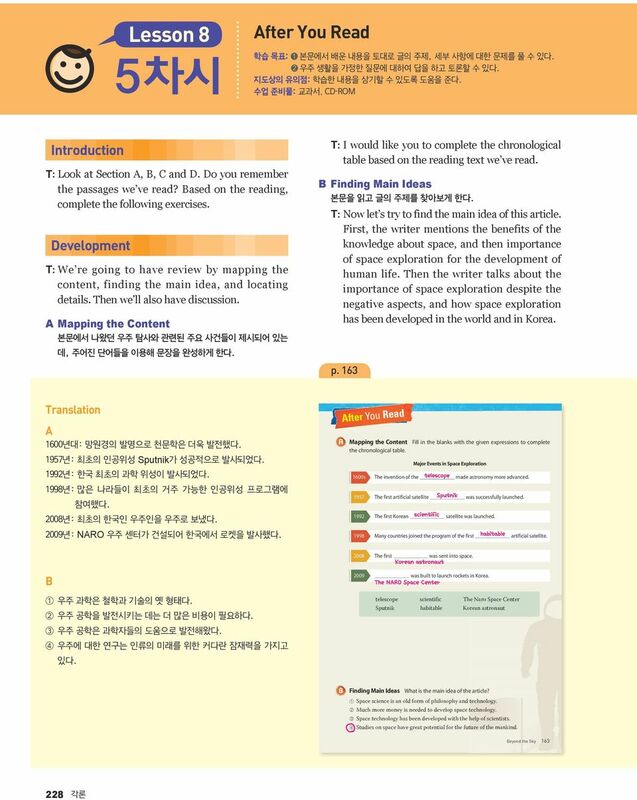 기해보고, 어려운 단어 및 글의 내용을 추측 추론해보는 연습을 하도록 지도한다. 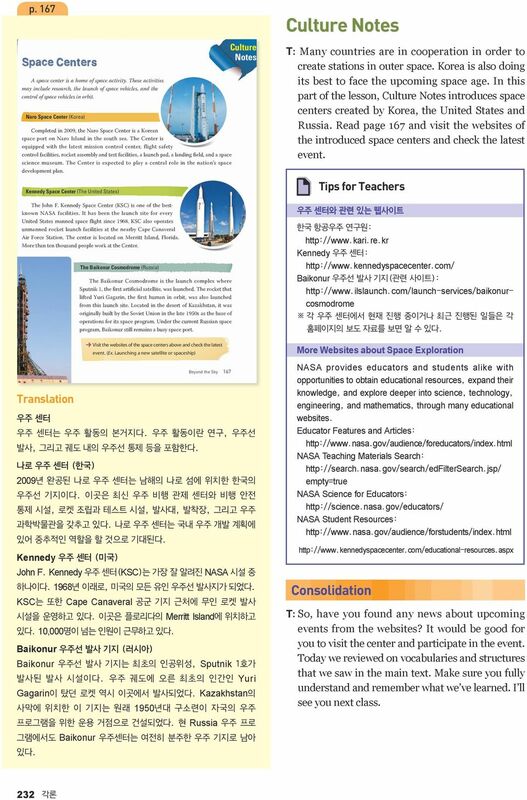 또한, 글의 내용을 간략하게 자신의 말로 요약 할 수 있도록 한다. 단원 목표 1. 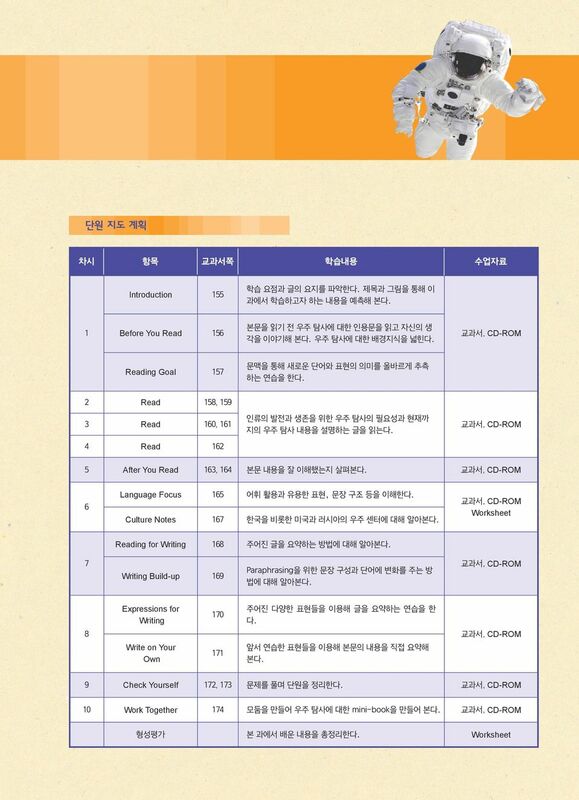 Reading Goal: Guessing the Meaning from Context Goal for Reading Guessing the Meanings from Context 앞뒤 문맥이나 상황으로 모르는 단어의 의미를 파악한다. 앞뒤 문맥이나 상황으로 모르는 단어의 의미를 파악한다. 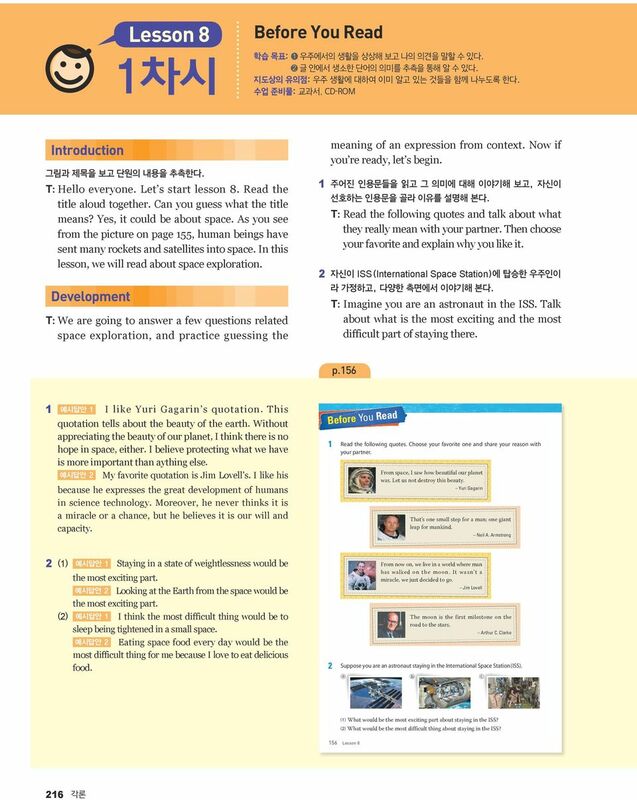 Goal for Writing Writing a Summary 글을 읽고 주요 내용을 간략하고 명료하게 자신의 말로 정리한다. p155 T: R eaders can guess the meaning of new words by using the context they are given. ❶ G u e s s t h e m e a n i n g o f a n e w w o r d or expression from its examples or explanations in the previous or next sentence. ❷ Understand the main idea and guess the meaning of new words or expressions in the context. 2. 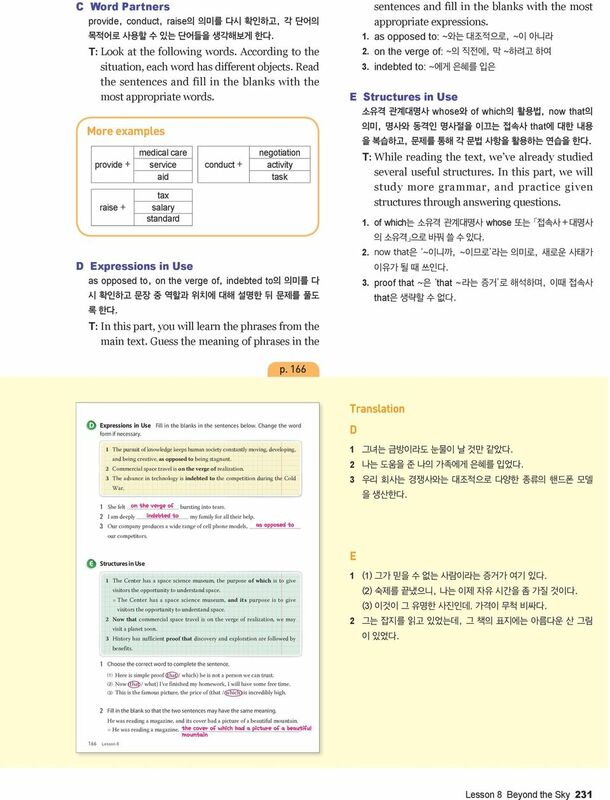 Writing Goal: Writing a Summary 글을 읽고 주요 내용을 간략하고 명료하게 자신의 말로 정리한다. T: Write a summary that includes the most important information. 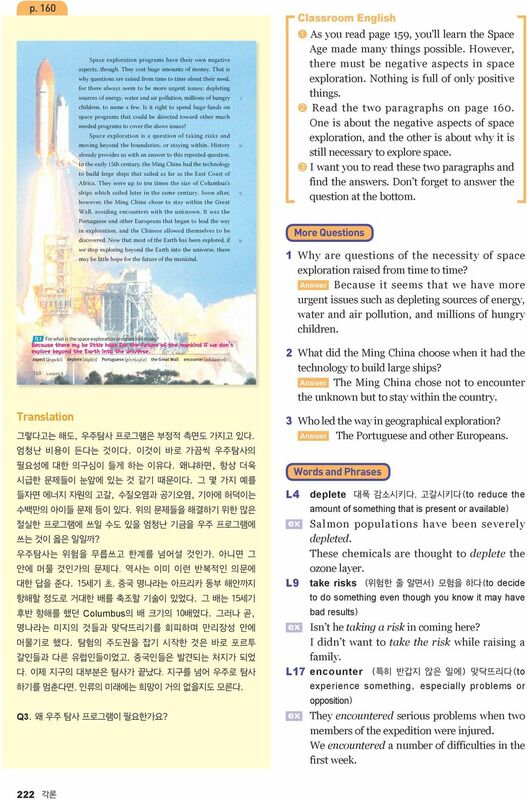 ❶ Find the topic of the reading passage. ❷ Locate key words and key sentences. ❸ Write the summary in your own words by paraphrasing.